So here's something I've been toying with. 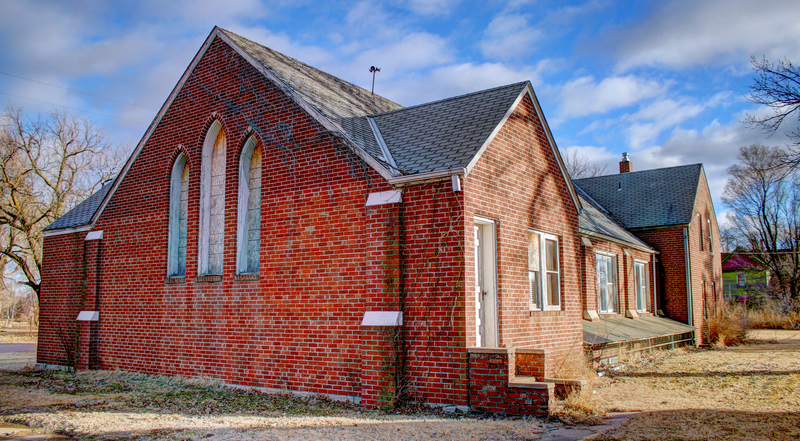 Purchasing an old Methodist Church built in 1945. I'm not entirely sure its for sale, but I'm not entirely sure its not. I went to City Hall in Great Bend and the girls who helped me knew all about it - that it had been purchased by a couple in Colorado who wanted it solely for its stained glass to sell in their antique shop. I have the estimate annual taxes ($350) and tract printout - approximately 4,500 square feet, two story, and full basement. The Mayor of Pawnee Rock tells me it has a commercial kitchen downstairs. Problem is, I can't find any phone numbers anywhere, though I do have the owners Colorado address. Think maybe I'll write them a letter. I really would like to get inside and see how actually doable this is, especially since I don't really do this kind of work myself. I thought if I did purchase it, it would make a fun home away from home/photography studio/goth rave nightclub. I dunno. I just think it really sounds fun! Very cool. I wonder what the inside looks like and if it's in good condition? that sounds awesome. i've never done any renovations, but i love watching them on tv, and it's a dream of mine to restore an old house. Yeah, me either. I really don't know what I'm doing at all, but its been fun to think about.